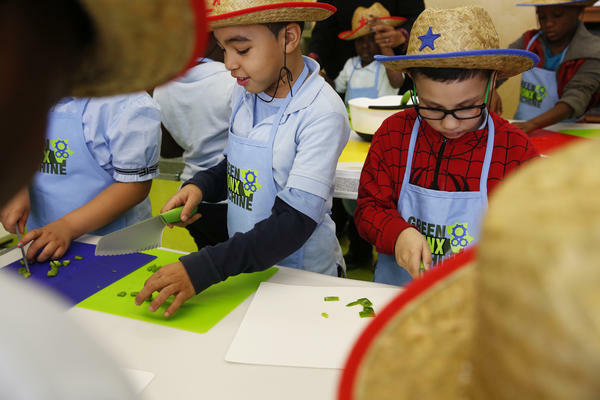 "What we're seeing is kids coming in here, getting excited about healthy food — about vegetables. About beans. Who knew beans could be so exciting, but they are!" Ritz founded the nonprofit Green Bronx Machine, planting community gardens all over the Bronx. Though he's often at school six days a week, he's paid for just one. He says it's his wife who makes ends meet. 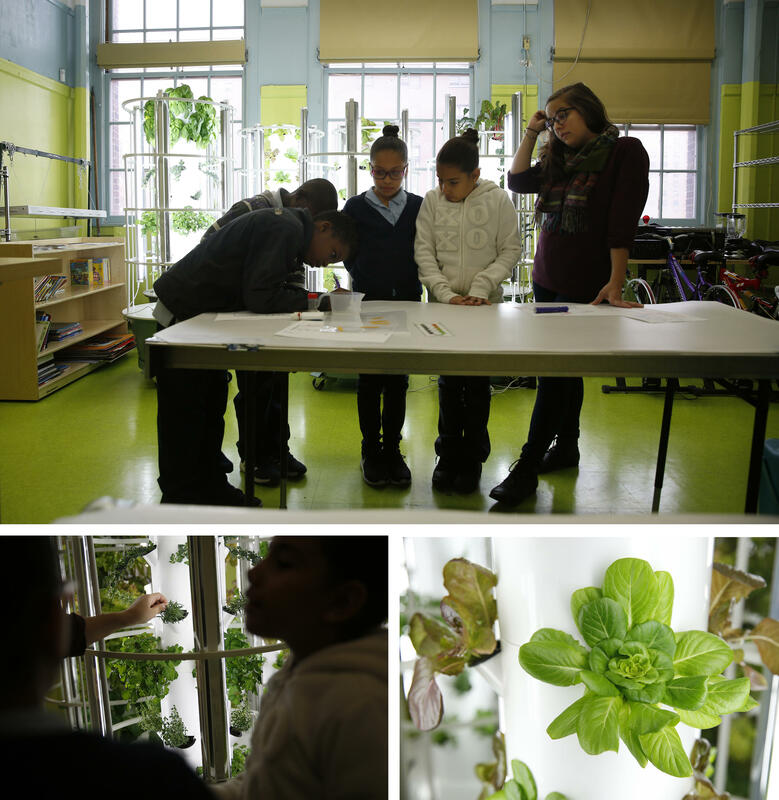 Ritz teaches science in the nation's poorest congressional district, at Community School 55 in the South Bronx. The neighborhood is a food desert, where Ritz says it's easier to buy liquor than lettuce. He calls the food options a M.E.S.S. — "a manufactured, edible synthetic substance that comes in a Ziploc, hermetically sealed bag with infinite shelf life." Ritz's goal: send students home with 100 bags of fresh, school-grown fruits and vegetables a week, 50 weeks a year. In the afternoon, Ritz hosts a fourth-grade cooking class. On the menu: vegetarian chili. Everyone gets a cooking hat, though not like Mister Ritz's (he wears the cheesehead as a self-described "cheeseball"). The kids are told to hold a knife like they're shaking a hand, and hold the pepper with their fingers curled into a bear claw. Fifth-grader Ernest Fields calls Ritz "Father Nature." At CS55, Ritz helps other teachers, too. He pops into one classroom for a quick science lesson on owl pellets. "You're gonna take apart this mouth poop," Ritz asks the class, feigning disgust, "and put it back together again and make real skeletons?" 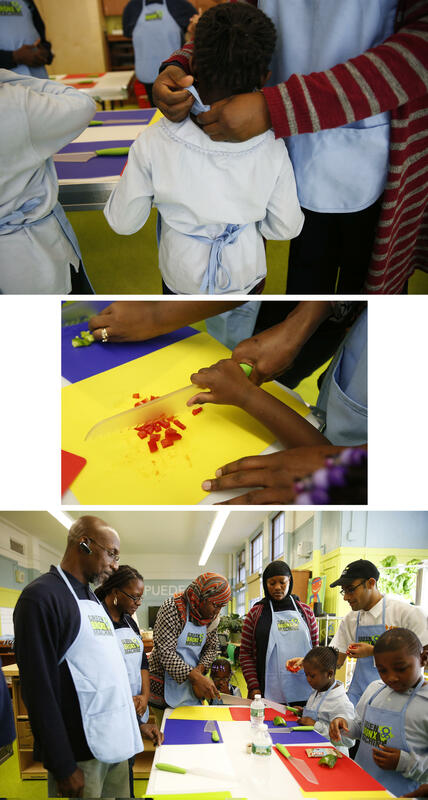 After school, Ritz hosts another cooking class, for kids and their parents. Jeffrey Haywood (far left) brings his grandson, Cori (far right), a third-grader. Haywood says he can't believe what Ritz is trying to do here. When he was a kid, Haywood says, "we didn't have no plants growing in no schools. If anything, we was trying to get into the schools." Ritz got his green thumb many years ago while teaching at a Bronx high school. Someone sent him a box of daffodil bulbs. Not knowing what to do with them, he stashed them behind a radiator. A few weeks later, a fight broke out. Ritz says one student ran to the radiator because, he assumed, the boy had hidden a weapon there. Instead, he found "hundreds of flowers busting out of this box. And the kid, instead of coming out to beat someone's behind, came out with a box of flowers. The class burst out laughing." Ritz says he had an epiphany. He and his students went on to plant some 20,000 bulbs across New York that year. The lesson, Ritz says, is that a seed well-planted can grow into something beautiful anywhere. 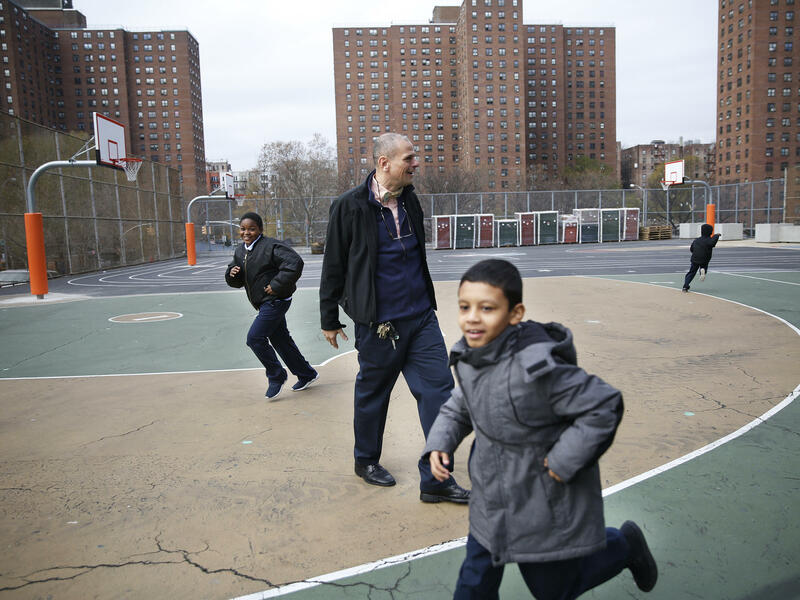 In the South Bronx in New York City, one of the poorest communities in the country, you can find one of NPR's 50 Great Teachers. His school, Community School 55, doesn't have a lot of money. The students live in public housing. Many of them have seen violence at home or in the streets, and that's precisely why teacher Stephen Ritz has turned the school's old library into a science lab like none other. Cory Turner of our Ed team reports. 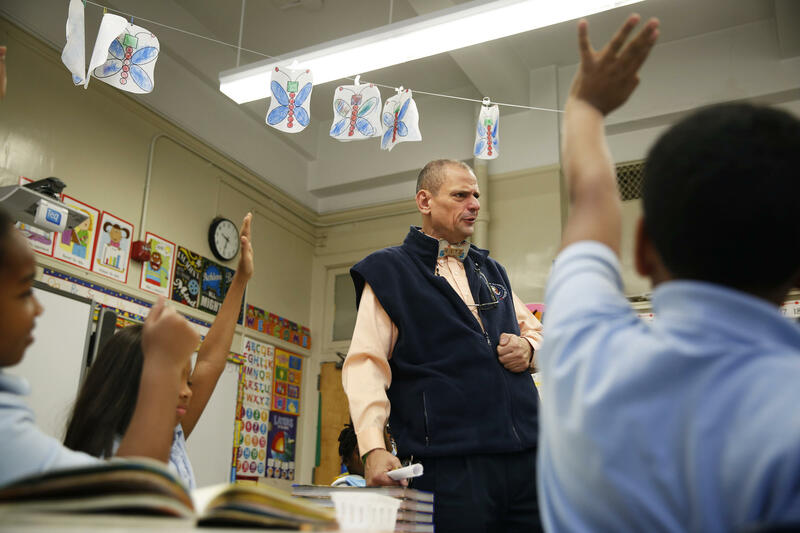 CORY TURNER, BYLINE: To say Stephen Ritz teaches science is like saying fire is warm or a shark bite hurts. It's true but so understated it might as well be wrong. This is what Ritz really does. STEPHEN RITZ: Did you need some beans, Mr. Ricardo? RITZ: I got lots of beans for you. Here come the beans. 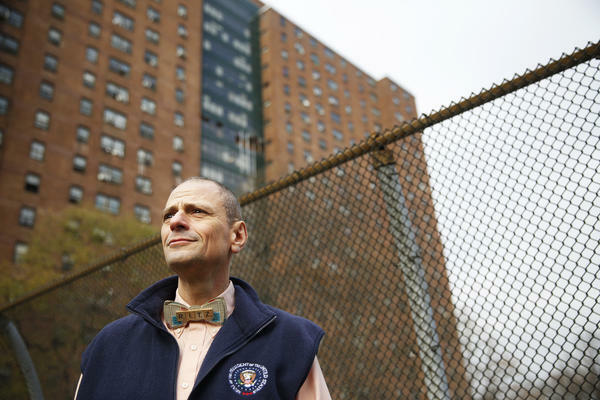 TURNER: Stephen Ritz is a force of nature, figuratively because his energy sweeps kids up like a tornado and literally because in this food desert where it's easier to buy liquor than lettuce, he's helping students grow a garden inside his fourth floor classroom. RITZ: We've got lettuces. We've got herbs. You've got cilantro, parsley, basil. TURNER: Ritz gets really excited when he comes to the kale. RITZ: This kale here - this incredibly robust and, I mean, I wish there was a way - here, come listen. Feel how thick those leaves are. I mean, those are going to be crunchy kale chips. TURNER: Ritz does it all using something called a tower garden. Imagine a tall hollow tube with a 20-gallon basin at the bottom. The tube has lots of slots for seedlings - no soil required. Water and nutrients are pumped up from the basin and allowed to drip back down. 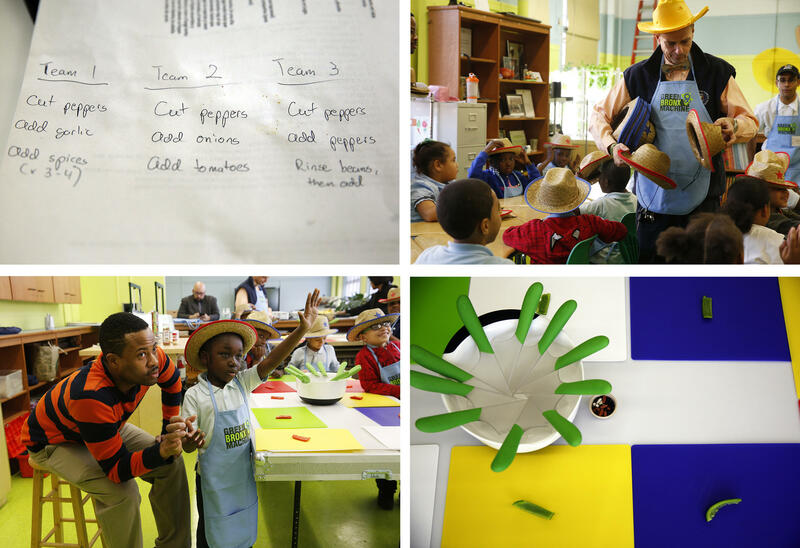 RITZ: In this class, we go from seed to tower to table to plate in 20 feet. TURNER: Ritz is showing off his newly refurbished classroom - a passion project. At night, the green floor and soft blue walls make it appear to glow to anyone walking between the projects outside. Inside, half the room is taken up by new desks and green chairs. The other half of what Ritz calls his National Health Wellness and Learning Center is brimming with things you'd never expect in a crumbling, cash-strapped urban school - tower gardens bursting with greens, gleaming cabinets and counter space, an industrial sink and a brand-new mobile cooking station that Ritz can take to any classroom in the building. RITZ: What we 're seeing is kids coming in here, getting excited about healthy food, about vegetables, about beans. Who knew beans could be so exciting? But they are. TURNER: At this point you need to know a few things about the man who wears a bow tie made of Scrabble tiles that spell Ritz and a foam cheesehead shaped like a cowboy hat. He started teaching in 1983. When Ritz says he does this job for the kids, it's not a line because he's mostly a volunteer. Though he's often at school six days a week, he's paid for just one. He's married and says it's his wife who makes ends meet. Many of the improvements at the school from his tireless fundraising. 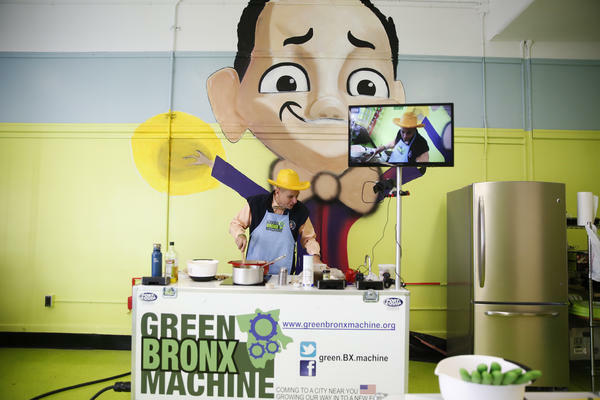 He founded a nonprofit called Green Bronx Machine, planting community gardens all over the Bronx. At CS55, Ritz knows no boundaries. Here, he pops into another teacher's classroom to help with a quick science lesson on owl pellets. RITZ: These guys, my little friends, you're going to take apart this mouth poop and put it back together again and make real skeletons. UNIDENTIFIED WOMAN: That's exactly what we're going to be doing. RITZ: You mean to tell me that one of those is going to be a bird, one of those is going to be a rat, one of those is going to be a mouse. RITZ: This is a cool class. How many of you guys like science? TURNER: Every hand shoots up, eager to please Mr. Steve. And then the tornado takes over. RITZ: I love it. More nerds - nerds, nerds, nerds, nerds. UNIDENTIFIED STUDENTS #1: Nerds, nerds, nerds, nerds, nerds, nerds, nerds, nerds, nerds, nerds. TURNER: Ritz then swings by another teacher's classroom to pick up a few kids who've earned a trip to the garden for good behavior. RITZ: I need Omar. I need Zuhaiti. UNIDENTIFIED STUDENTS #2: She's not here. RITZ: Zuhaiti's not here. OK. I need Ernest. TURNER: Again, hands fly. Kids lean out of their seats, quietly pleading to be picked. COMFORT QUARSHIE: Behavior-wise, I use Steve's work here as an incentive. QUARSHIE: No work here, no garden, and it works for me. TURNER: It works, she says, because the kids trust Ritz. He's a father figure in a community where many students don't know their fathers. ERNEST FIELDS: You could call him, like, Father Nature. ERNEST: Sometimes the fruits and vegetables in there are decayed because most people don't pay attention to it. TURNER: Ritz says the food in these neighborhood stores is a mess. RITZ: A manufactured edible synthetic substance that comes in a Ziploc, hermetically sealed bag with infinite shelf life. TURNER: Since families can't buy much healthy food here, Ritz says, he's growing it for them and planning to add more tower gardens soon. He's just been given permission to grow food for the cafeteria downstairs. And within the year, he hopes to send the kids home with a hundred bags of fresh groceries a week. He's also helping to teach kids how to cook all that food. 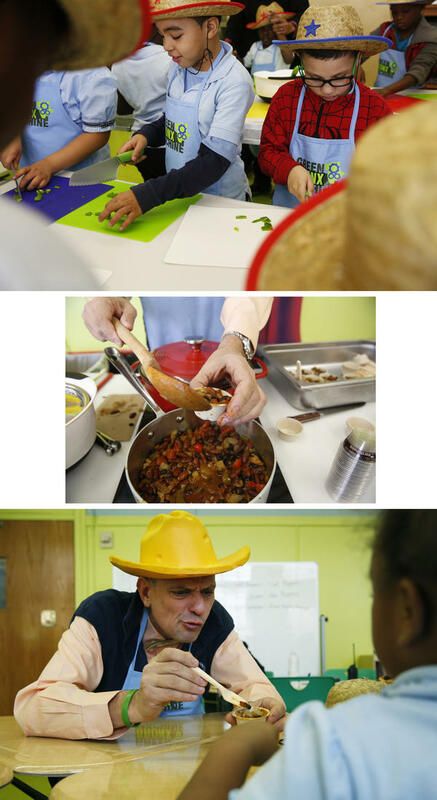 In the afternoon, one fourth grade class learns to make veggie chili. UNIDENTIFIED STUDENT: It's so delicious. TURNER: Yeah. What do you like best about it? UNIDENTIFIED STUDENT: The beans and I like the pepper that we made. TURNER: After school, Ritz hosts another cooking class - this one for kids and parents. RITZ: It smells delicious in here. Grab a seat. I'm just saying hello to everybody. JEFFREY HAYWOOD: We didn't have no plants growing in no schools. If anything, we was trying to get into the schools, you know (laughter)? TURNER: Haywood stands at a table beside his grandson, and together they chop red peppers. RITZ: I literally thought there were onions. I didn't know what they were. RITZ: Hundreds of flowers bustling out of this box. And the kid, instead of coming out to beat someone's behind, came out with a box of flowers, and the class burst out laughing. We didn't know where it came from. TURNER: The kids were thrilled. And Ritz had an epiphany. He and his students went on to plants some 20,000 bulbs across New York. The lesson, Ritz says, is simple - a seed well-planted can grow into something beautiful anywhere. Cory Turner, NPR News, the Bronx. Transcript provided by NPR, Copyright NPR.